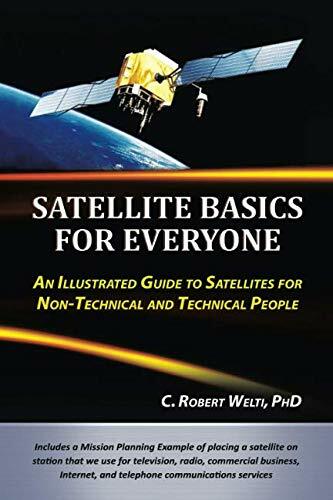 Satellite Basics for Everyone intends to stimulate a wide interest in engineering and science sorely needed to overcome our educational deficiencies to compete in the global economy. It offers a laypeople portal to the amazing world of satellites; indispensable to our everyday life and security. Something for everyone: come away with a level of new knowledge commensurate with your level of education to date. Learn about satellites that affect us every day, how they work, and how we can place and keep them on orbit by integrating science, technology, engineering, art, and mathematics (STEAM). Satellite Basics for Everyone presents an introduction and overview to satellites. Its written as clearly and understandably as possible for a wide audience. It provides a learning tool for grade school students. High school and college students can use it for helping them decide on career fields. Its for people with curious minds who want to know about satellites that affect their daily lives. And, it provides a training tool and an overview for people who build, operate, and use data collected by satellites. Satellite Basics for Everyone describes satellite missions, orbits, population, closeness, debris, collision risk, builders, owners, operators, launch vehicles, and costs. Focus then turns to describing the orbit, components, environment, and operation of the geostationary communications satellite because it affects our daily lives the most by providing television, radio, commercial business, Internet and telephone services. A description of satellite motion prepares for the included Mission Planning Example of how to place and keep this satellite on orbit and keep the antennas pointing in the right direction to perform its mission. About: Learn about satellites that affect us every day, how they work, and how we can place and keep them on orbit. About: Satellite Basics for Everyone intends to stimulate a wide interest in engineering and science sorely needed to overcome our educational deficiencies to compete in the global economy.